Hello to all you lovely brides/Groom’s to be on Ibiza. It is always more difficult organizing your wedding when you are far away and as every item is important on your wedding day, the list is endless and can cause so much stress. A wedding planner can and is always helpful and many of the venues provide someone as a free service for you, or of course you can choose one from a number of experienced planners on the Island. It is always worth listening to their advice, although of course it is always important for you to remember that it is your unique day so it has to be as you want it to be. I do concede on many points that the wedding planner will be right, for example: If you are marrying during late June/ July, whatever you think, do not marry before 4.30/5pm if your ceremony is to be outside, especially if it is to be on a beach in fact the later the better, the heat is just far to oppressive not only for you in your bridal gown/ Groom’s suit , your poor guests will most likely have travelled from much cooler climates, will be wearing their ‘best attire’ and so will not appreciate standing/sitting in full sun for 30/40 minutes, it can seriously ruin your day. Here are a few Points to consider when ordering your wedding cake. Employ an experienced cake maker. When looking for a cake maker – there are not too many on Ibiza so it is not too difficult, look at the work they have produced before. Don’t just look at the ‘pretty picture’ we have some amazing photographers on this Island so they do produce some lovely pictures hiding the faults it does need to look good on the day. Really look to see if the cake has been ‘finished’ properly. For example: The Cake board edging iced, the decoration handmade and edible and neatly finished, the cake stand of good quality, the actual total display is it pleasing to the eye, photogenic? 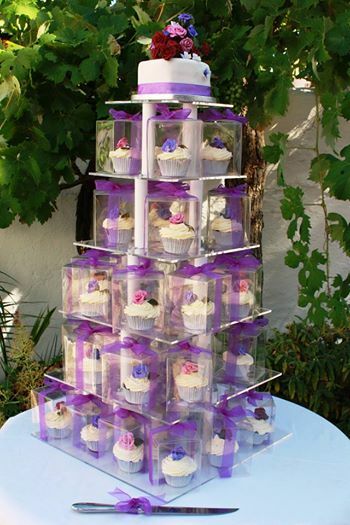 for example: were the cupcakes lined up nicely, no unsightly mess around the edges, or put on the stand with cases showing the ‘backs’ as opposed to being prettily and daintily displayed. All of this should be to be taken in consideration before making a decision, if ribbon is used it should be neat and straight. Fresh flowers should be in containers so as not to contaminate the cake. Don’t just go on the first price, often there are lots of hidden extras after the initial pricing is given, if you pay cheap then invariably the finished cake will be cheap too. Ask about flavours and layering inside the cake. Or inside the cupcakes, good cake makers will have flavorsome filling and at least 2 layers. When you feel comfortable about your chosen cake maker look for lots of pictures of styles you like, let her know the type of design/look you are aiming for. If it is to be with some colour send a ‘swatch’ or a close colour copy. Let her know which flowers you will be using on your wedding day, even send pictures if you want the cake to reflect the bouquets. If at all possible have a meeting with your cake maker, a good cake maker will get the feel for your choice of cake and together you can design something lovely. Have a tasting, so you really know what you are giving your guests to eat. Follow those guidelines and you should get the perfect wedding cake. For some reason on Ibiza there is a trend in cutting the wedding cake late in the evening before the first dance and is consequently often put in an area away from the main dining area, which to me is quite in appropriate. The cake should be displayed throughout the wedding feast – nearby the dining tables in full view of all the guests and importantly in view of the Bride and Groom. It is part of the decoration a lot of thought and work has gone into it, so it should be displayed as such. The couple should be photographed as they cut the cake after the main course, so that the cake is served alongside the dessert and coffee.